Two runners at Sandown on the Lakeside course on Wednesday after scratchings in Eagle Ridge and Potemkin. Eagle Ridge (pictured) runs in race five, the Le Pine Funerals Handicap for three-year-olds over 1400m with Stephen Brown to claim and jumping from the outside barrier 12. The son of Turffontein finished runner-up at Geelong at his last start and has been scratched from races recently due to wide barriers. “We just can’t draw a barrier with him but we’ve decided to run as there have been eight scratchings,” Mike Moroney said. “The field has been reduced and he’ll still need a bit of luck from where he’s drawn but it’s a long run from the barrier to the bend so we’re hoping he can get in and find some cover. Potemkin runs in race seven, the Blue Star Print Group Handicap over 1600m where he jumps from barrier three with Stephen Brown reducing his weight to 58kg. Potemkin won his last start over 1600m at Ballarat on a heavy track and Moroney is unconcerned about striking a good track at Sandown. 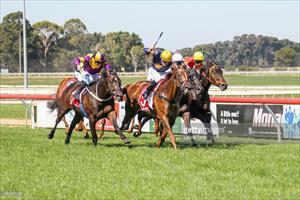 “He’s a versatile horse and has won on ground ranging from good to heavy,” Moroney said. “His last start was a brave win, racing on the speed and coming away. He drops a kilo for that and Stephen stays on so from a lovely draw he should get every chance.